Expect Facebook to either build or buy one of these exchanges – just as Google did with the web (AdX via DoubleClick). Most observers are claiming that this step augurs a day when Facebook will launch a full-blown ad network across all platforms – video, web, and mobile. I have to agree – I wrote as much in those predictions in January. What I didn’t see was Facebook starting its ad network by launching an exchange (called FBX) and then moving into mobile before it did web. But upon reflection, it all makes sense. FBX allows Facebook to gather data about web-based buyers’ purchasing habits. FBX is essentially a massive retargeting engine that connects web cookies to Facebook’s internal databases. That will come in quite handy when it launches an Adsense competitor. And launching its first true off-domain ad network in mobile first signals to Wall Street that the company has its priorities straight – its been dinged repeatedly for being too focused on the web. The key to this new mobile network is that Facebook is selling its data, not its inventory. If the company gets good at that, watch out. These moves elevate Facebook into new arenas of competition with Apple, Google, Microsoft, and Amazon, all of whom employ simliar product suites. And yes, I did include Amazon in that sentence – the company is far more engaged in the advertising business than you might have thought. More on that in another post. Wall Street seems to like it. FB up 3.5%. why a single advertising in this page rssfeed is accounting alone for 15Mb of traffic? I just hope they accelerate their strategies and get past all the negative news. FB is going to be a lead contender soon – they have a rich platform. They need to get stuck in on product alignment and great execution, and get past the initial hiccups. Pingback: Facebook Re-targeting: What does it mean for advertisers? 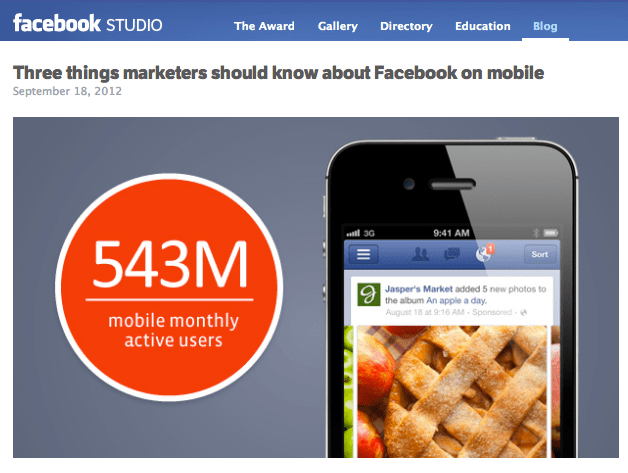 it is clear that Facebook is a great platform for advertising, great information, thanks!